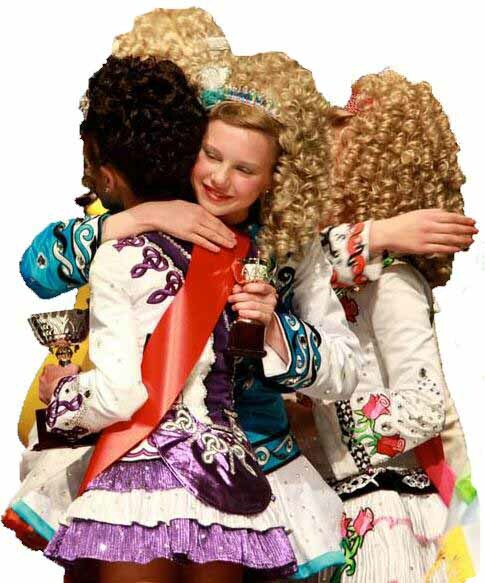 A primary dancer can start to think of getting a solo dress and a wig. Please don't go all out and get the best dress and the biggest wig. Your teacher will advise you to keep her costume in line with her growing ability. If she is all tricked up like a champion and yet dances like a child just out of beginners she could be at more of a disadvantage than if she had dressed more conservatively. Your teacher knows what is expected, she is not trying to 'hold her back' but get her only good attention. Once she is promoted to Intermediate and Open and competes in the State Championships and Nationals she can wear all that wonderful glitter that she has been pining for. The glitter and wigs gives nervous mothers something to do. You can make your own if you're talented and you can send away for a pattern from Irish Threads. But the dropped waisted dresses in fashion now are hard to find patterns for. Please Note: It is illegal and unforgiveable to copy someone else's dress. Even if your daughter says she wants a dress just like the one she saw on the web, explain to her that it is not allowed. There are many talented designers around, for a reasonable price you can have an original. Especially in the higher grades, a knock off will be noticed and your daughter may suffer because of it. Beginners cannot wear wigs. However when your child progresses you will be happy not to curl hair any more. 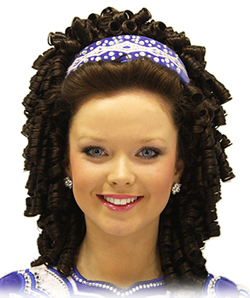 With the advent of very good wigs, dancers above beginners purchase wigs. The old-fashioned wigs looked nylon-y and fake, but the new breed can look very real. They cost from about $70 or so and come in a bun wig or full wig but check with your teacher before you buy either. They need to be looked after and packed away properly after every use. Spraying them with wig conditioner helps too and also having them recurled when they get too fuzzy. The wigs must be attached properly so they don't come off with all that energetic dancing. If you want hints on how to attach the wig securely there is a description how here. 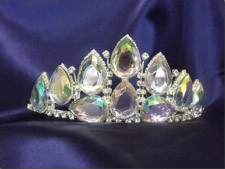 You can buy socks with diamantes sewn on, you can buy tiaras and crowns. You can put sparkly buckles on your shoes. You can put flowers in your hair. You can pin on your Nana's brooch for luck. Or you need not do any of it. It really is up to you and your child. Different colours and styles of wigs. White tape is in fashion at the moment. It gives the leg a longer line and can make your feet look more "turned out".